Heavy Hook Sword Canes for sale are 37 3/8th inches in all. 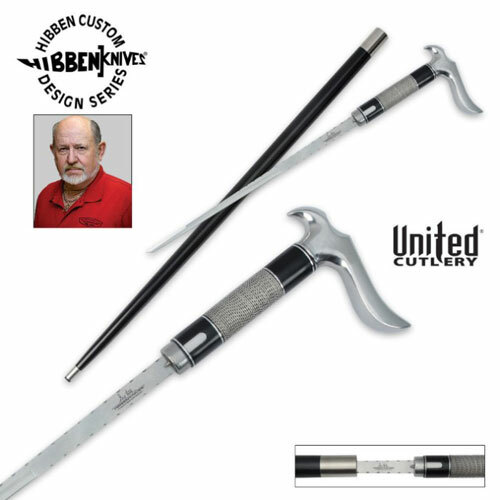 These functional sword canes are designed by Gil Hibben and feature a mirror polished blade and shiny hook handle. The wooden shaft features a black satin finish and is accented with highly polished stainless steel. The 14 ¾ inch mirror polished tanto size blade is crafted of 7CR17 stainless steel. The blade is released from the shaft with a built-in quick release blade mechanism. The mirror polished heavy hook style handle is made of heavy duty stainless steel. Buy the popular Heavy Hook Sword Cane for $129.99.